Most of the therapeutic tools in my collection are incredibly versatile and can be used to address a number of different goals. One of my favorite tools is the stretchy band. 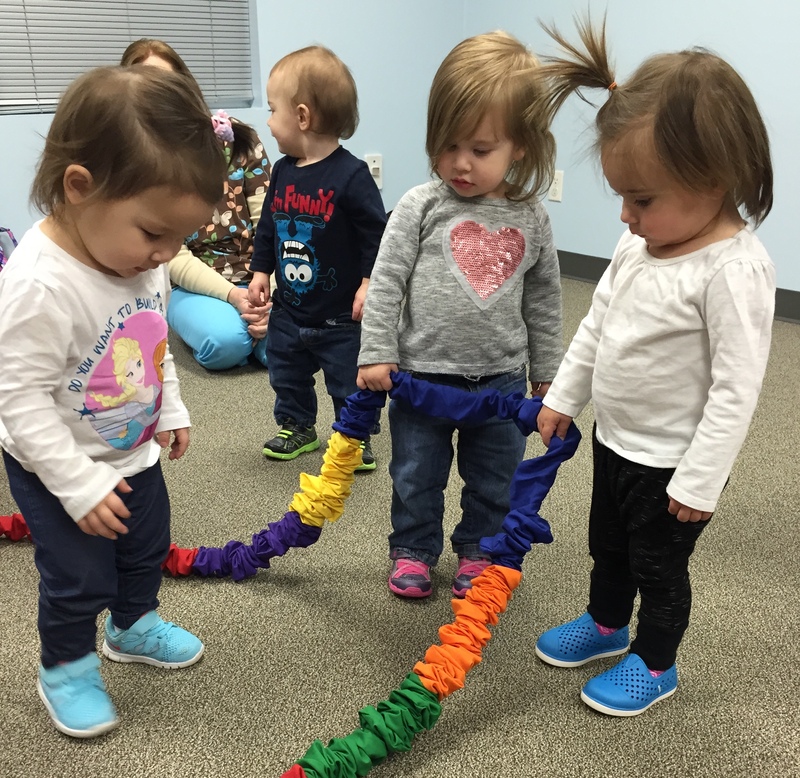 When used in a group setting, a stretchy band can bring about social awareness to children (“wait, so you’re telling me there are other kids attached to this thing? !”) along with targeting other important areas of development. 1. 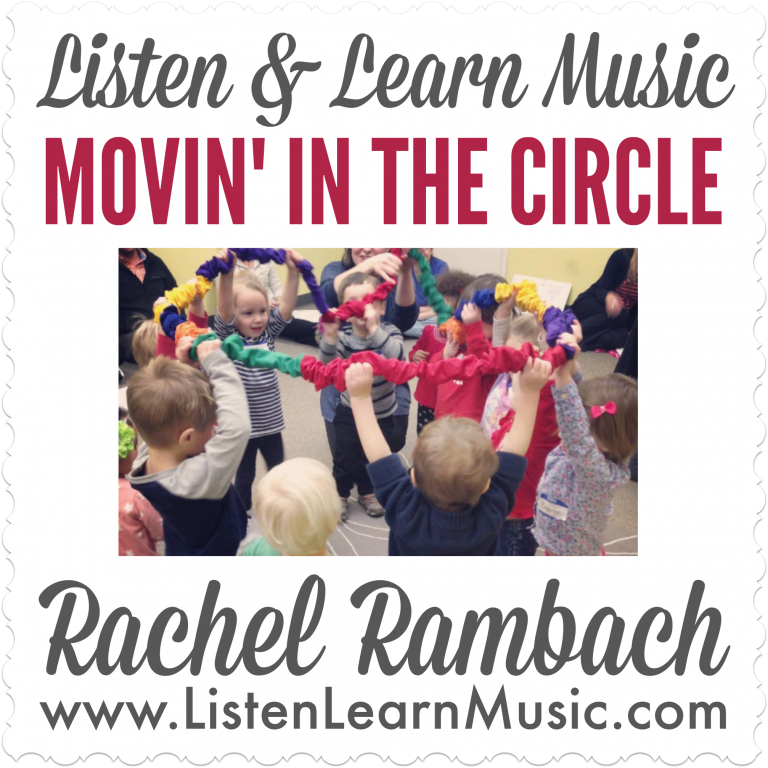 Movin’ In A Circle is a great song to use when introducing children to the stretchy band. 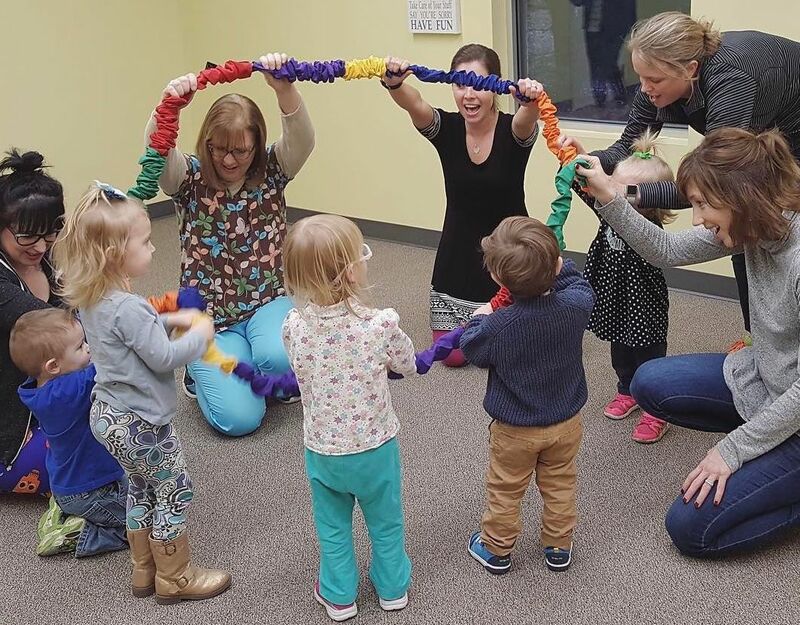 This song is intended to be used as children sit in a circle on the ground, and in this way, allows children to explore a new object, while also testing their body’s ability to stretch, reach, and use their muscles. The verse gives the children an opportunity to reach in and out, up and down, and to stretch one hand up high while the other is down low. I also add in swaying from side to side and encourage the children to cross their hands past midline when swaying. This song also includes counting up to 4, so in addition to the motor skills, directional awareness, and social skills they’re working on, children can also practice their counting skills. And because of the repetitious nature, there are multiple opportunities to practice all of these skills during the song. 2. ‘Round We Go is a motivating song that has an element of “freeze dance”, which all children love! This song is a fun way to practice impulse control for young children in a group setting. With clear key words and even clearer musical cues, the children know exactly when they’re supposed to be moving around the circle, and when it’s time to stop. This song presents opportunities for a variety of movements, such as tip-toeing, stomping, or just plain old wiggling. It might even be fun to walk backwards or encourage the children to think of their own movements. Something I always like to add into my “freeze” songs is a ‘waiting’ verse, so instead of going straight from “stop” to “go”, try humming the melody for one whole verse, and see how long your kiddos can wait before they need a reminder. I always act super silly so that this waiting time is engaging for the children, but they’re still listening for their cue. This will give the children an extended time to practice impulse control (and then you can tell parents and teachers that the group was able to wait a whole verse, and watch their jaws hit the floor). 3. Let’s All Move Together is the newest stretchy band song I’ve been using lately, and let me tell you, it’s so catchy, you’ll know this song by heart after a few listens. Although this song was written with the intent of the children standing in a circle, I’ve used it successfully with children sitting or standing, whatever is most appropriate for that group. With the added challenge of standing up, children are able to even further explore their own physical abilities. When they reach up, can they reach and stand on their tiptoes? When they make the circle grow outwards, can they walk backwards without looking? These are all excellent challenges for young children and allow them to explore their physical limits in a structured and safe environment. These three tried-and-true stretchy band songs are motivating and challenging in different ways, but one thing is for sure: they’re all catchy and fun! Tell me in the comments below: what is your favorite way to use a stretchy band?